According to Assist News Service, US Immigration and Customs Enforcement has seized a painting called “Cristo Portacroce” and returned it to the Gentili family. The painting was one of many forcibly taken from the estate of Federico Gentili di Giuseppe after the Nazi army invaded France in 1941. Some of the family escaped to Canada and the US, while others died in concentration camps. The painting was seized after the current owner, the Pinacoteca di Brera in Milan, Italy, had lent it for display at a museum in Florida in 2011. 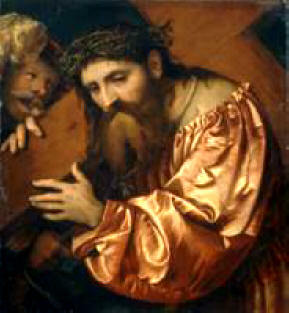 The painting (Christ Carrying the Cross) was painted by Girolamo de’ Romani about 1538.